His withdrawal from consideration as Fed chair could mark a watershed for the left wing of the Democratic Party. The Sunday afternoon announcement that Larry Summers is giving up his quest to become Federal Reserve chair resonates with meaning for reform—both for the economy and for the Democratic Party. After several decades of dominance by the center-right New Democrats and their financial prerogatives, this is a huge loss for the wing that has been led by former Treasury Secretary Robert Rubin and the Clintons. And it foretells more to come. When the Obama White House let it be known in early summer that the president expected to appoint Summers as successor to Fed chair Ben Bernanke, the party grassroots erupted in rage and rebellion. It amounted to a reward for the very policy architects who led the country into ruin with financial deregulation and Wall Street–friendly bailouts for the “too big to fail” bankers. But instead of going along meekly, progressive Dems created a firestorm opposing Summers and kept throwing on new logs. The White House leakers kept reassuring favored reporters that it was a done deal, that the president really wanted Larry in this pivotal position determining policy on money and credit for the country. But leading reform senators—Sherrod Brown, Elizabeth Warren and Jeff Merkley—were having none of it and raised the ante. These key members of the Banking Committee told the administration that if Summers was nominated, they intended to vote against his confirmation. That could well have been fatal not just to Summers’s ambitions but Obama’s too. To make it worse, Jon Tester of Montana, a moderate by any measure, let it be known that he would join them in voting to block Summers. Among other liabilities, Summers was known for his contempt for policy opponents and for refusing to acknowledge colossal errors—the very opposite of a consensus leader. The White House mercifully pulled the plug on flawed Larry (it seems quite unlikely that Summers got the message on his own, considering his record of stubborn egotism). This is a huge victory for the prospects for genuine economic reform—well beyond anything Obama has so far proposed or accepted. The president might fumble around for a similarly conservative appointment, but he has a chance to change the outlook dramatically by appointing a new Fed chair who understands the deep dislocations created in part by Federal Reserve policy during the last three decades, from Paul Volcker to Alan Greenspan to Bernanke, under Democrats as well as Republicans. Obama can start the healing by naming as new chair Janet Yellen, the moderately liberal vice chair of the Fed, who well understands that much deeper change must be considered to get the economy back in balance. This could be a political watershed—the moment when this Democratic president chooses to focus on the future rather than clinging to the failed past. In other words, Obama can start to reshape his legacy by reimagining his economic policy and encouraging serious reform at the central bank and in traditional policies. The president, of course, cannot complete this new agenda in his remaining years, but if he launches it, he can teach the public what the task of economic reconstruction should involve. That is, he can begin the “new politics” many of us had hoped he would bring to Washington four years ago. In the next few months, as it happens, President Obama will appoint four—perhaps as many as five—new governors to the seven-member Federal Reserve Board. This is an extraordinary opportunity to influence the future—if, that is, he chooses wisely and reaches beyond the usual list of safe choices with conventional views. The defeat of Larry Summers tells the White House and this president they had better start listening to the restless reformers on the left of the party. Progressive Democrats in the Senate and House have serious ideas for reform. Having won this pivotal victory, they are sure to push for larger goals. Instead of running away from them, Obama’s presidency should put an arm around them. 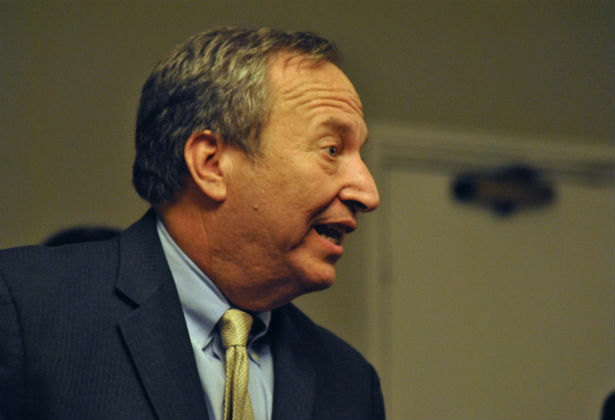 In July, William Greider wrote about how Larry Summers would be a terrible choice to head the Federal Reserve.